FX goes out of its way to remind viewers that Tyrant, its underbaked Middle East monarchy drama, comes from the creators of 24 and Homeland, which is as egregious an example of a respected brand attached to a downmarket product as the Lilly Pulitzer rompers that sparked near-riots at Target. Ironically, when Tyrant premiered in summer 2014, its pedigree hampered it out of the gate. The typically sharp Homeland had recently completed its third season sputtering on fossil-fuel fumes, calling into question the necessity for yet another prestige drama based on Middle Eastern strife. But to its credit, Tyrant didn’t strive to be a sobering, topical drama, despite such touches as its elaborate credit sequence and the most gorgeous title theme of the past year. It settled for being a male-skewing nighttime soap set in an ever-intriguing hotbed of global conflict, which is a theoretically solid idea. Bassam Al-Fayeed (Adam Rayner) is the younger of two sons born to the ruler of Abbudin, a country deliberately designed by creator Gideon Raff and producers Howard Gordon and Craig Wright as a hodgepodge of several touch-and-go governments in the region. Bassam, having fled Abbudin decades ago, lived a quiet life with his family and a pediatric practice until he’s called home to celebrate the wedding of his nephew Ahmed (Cameron Gharaee), son of the older Al-Fayeed scion, Jamal (Ashraf Barhom). Bassam and Jamal’s father dies suddenly following Bassam’s arrival, leaving the malicious, mustache-twirling Jamal as the obvious heir to Abbudin’s throne. As Bassam realizes his brother’s leadership would too closely fit the show’s title, he waffles between leaving Abbudin behind again or staying to make a play for the throne himself. Unfortunately, the plot closely echoes the production. Rayner is meant to anchor the show as Bassam, the conflicted younger brother struggling to keep the peace in his old family and his new one. But try as he might, Rayner’s performance is chilly and aloof, failing to properly communicate Bassam’s deep investment in the national upheaval, or in anything for that matter. Bassam is written as the natural-born leader Jamal is not, a pragmatist unswayed by money, the seductive nature of absolute power, or dogmatic interests. As played by Rayner, Bassam is merely an accidental tourist. The simplistic writing doesn’t help matters, as the show frames such common sense suggestions as, “Why don’t the heads of these warring factions sit down and talk things out?” as if they are paradigm-shifting breakthroughs only a cool-headed Yankee could have ginned up. Meanwhile, Jamal is a raging sociopath and an iron-fist caricature, and Tyrant leaves zero room for interpretation. Jamal rapes his soon-to-be daughter-in-law Nusrat (Sibylla Deen) as well as a local woman—as the woman’s husband and children are held at gunpoint just outside the bedroom door—and that’s in the pilot alone. And yet Jamal is the most compelling character Tyrant has to offer. Barhom outacts Rayner without furrowing a brow, and he’s only actor in the show who seems to be having any fun save for Justin Kirk, who lends his signature superficial charm to his role as an American ambassador. Tyrant is predicated on the notion that nature abhors a vacuum, and it also validates that notion as the audience is most drawn to the character meant to repulse it. It’s akin to a version of Game Of Thrones in which Joffrey Baratheon is a fan favorite because he’s the only viable option. 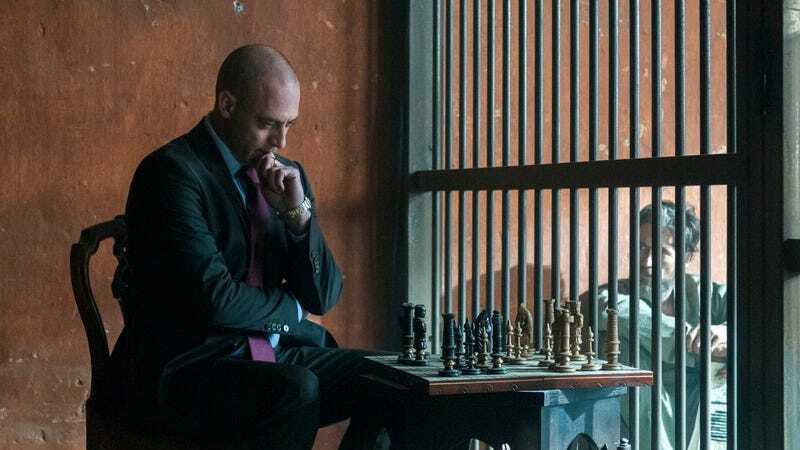 The first season finale concluded with a possible way forward for Tyrant, one in which Bassam’s role is dramatically reduced, if not eliminated entirely. Bassam attempts to unseat his brother in a coup that goes awry, as meticulous plans are wont to do. The punishment for treason is death by hanging, and it’s difficult to make a show about a ruthless dictator if he’s going around pardoning people for trying to forceably wrest control of the country away from him. Alas, the early episodes of Tyrant’s second season doubles down on Bassam and Rayner, keeping him at the center of a story that seems to neither want nor need him there. At the risk of spoiling anything, Jamal lands on a solution that absolves him of his brother’s murder while retaining the reluctant cooperation of Abbudin’s citizens. The plan, which is revealed in the season two premiere, is overtly telegraphed and narratively insulting. It actually requires the audience to care more about Bassam in this season than it did in the last. Predictably, Jamal continues to be the show’s unintended focal point. Barhom injects life into a new version of his character, a Jamal bruised by the country’s barely concealed hatred of him, who hopes he can turn the public sentiment in his favor. A tragic incident early in the season places him in a precarious position, which is compounded when a ghost from his past appears at an inopportune time. Barhom makes the best out of the writing, which still has its dull edges and abject lack of subtlety. Lack of nuance is a huge problem for Tyrant, a tragedy considering the depiction of a foreign region’s struggles is a pure exercise in nuance. Rayner is a constant reminder of how Tyrant beats the audience about the head. Rayner, a white British-American actor, was cast to play an inexplicably blue-eyed Al-Fayeed, a choice that requires the young boy who plays Bassam in flashbacks to have his eyes colored blue in post-production. That seems like a lot of effort to go to, as if the producers thought the only way to communicate that Bassam was the Americanized outsider was to cast an actor who doesn’t physically resemble any of the actors cast to play his relatives. For viewers who want their Middle East intrigue overpowered by sugar and salt, then spoon-fed to them, Tyrant is doing that as well as ever. But with Bassam in control, the show will never stabilize into something great.